One of my new favourite destinations while in Japan is the VR theme park that Bandai Namco has constructed right in the heart of Kabukicho. Yes, the one that lets you play Mario Kart in VR. I had the good fortune of going along to it soon after it opened, under the belief that it was only a temporary thing, but it would seem to be popular beyond Bandai's wildest expectations and has become a permanent attraction. It's still there, and as long as it keeps getting new "rides" in like the Dragon Quest VR game I just played, it's going to be there a long time yet. Related reading: For more on the VR arcade, read my thoughts on it from my first visit last year. Dragon Quest in VR is, without the slightest bit of exaggeration, everything I ever wanted VR to deliver. It is immersive, entertaining, and a fundamentally different and more exciting way to play Dragon Quest. 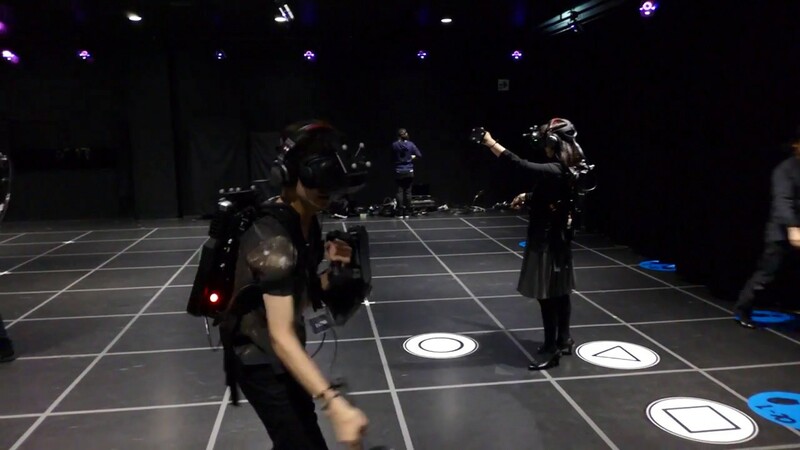 Of course, it doesn't have the narrative (the "ride" itself only lasts around 15 minutes), but then that's what VR theme parks are best at; giving people arcade-like experiences that wouldn't be possible at home, even with a PlayStation VR or Oculus unit. Dragon Quest VR takes place in a large, empty, hall-like space. You, and three other people, don VR headsets and backpacks that let you all take on a traditional Dragon Quest role; I was one of two fighters in the party (along with another dude), my wife was a healer, and my warrior-mate's girlfriend was a mage. Within the hall space we had freedom to move around and battle with a range of Dragon Quest's iconic monsters. Once a wave was defeated we were transported to another area, and after a couple of those we had the opportunity to take on the Dark Lord. To help us in our quest, each of us had tools appropriate to our trades. Our team's warriors had heavy shields and swords, while our magic users had wands. To fight, we had to swing the swords with precision (naturally the VR mapping meant that the sword moved in a 1:1 fashion with our own movements), while lifting the shield to block incoming attacks. The magic users could raise their arm to select from a range of different spells, some of which would attack enemies. Others would buff or heal the team (especially the warriors... we took a lot of damage). It's difficult to describe just how exhilarating this really was. I've played a lot of VR games, of course. The PlayStation VR headset is one of my favourite bits of gaming equipment, but there is a stark difference between a bit of home technology that is limited in that the developers can't ask you to physically move around while wearing the headset (it would be too dangerous), and having a large, empty warehouse space and freedom from wires (since all the VR data was being transmitted to those backpacks we wore). 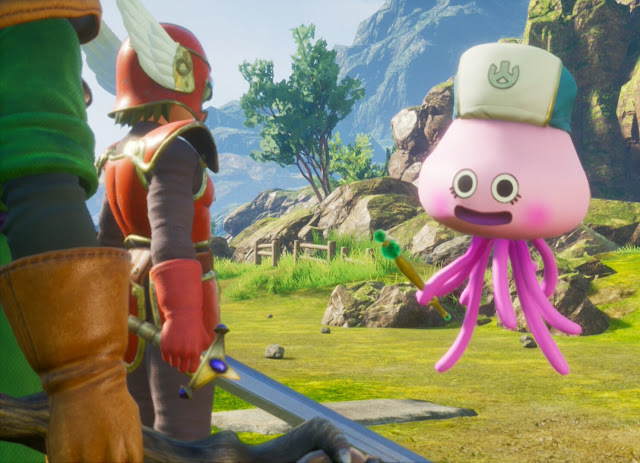 Instead of being constantly reminded that we were playing a game, with Dragon Quest VR it was possible to physically walk up to a slime and wallop it with a sword. It was possible to defend your team from a giant golem's incoming mega-sized fist. Enemies would come from different directions, and so you had to make real strategies with your team mates. There was a moment where the other warrior dude and I moved in two directions to take point as enemies came at us from different sides, and slowly we were pushed back to the point where we were fighting literally back-to-back. My wife and I were paired up with the other two people on our team randomly, but we made fast friends with them, because they were hilariously good fun and got right into the spirit and roleplaying of it all. It was so immersive that completely without thinking, when we took down that golem boss I actually did a "BY THE POWER OF GREYSKULL" pose and yelled "YES!" It was hilarious, but it was also fitting, because we all really did buy into the adventure being offered. 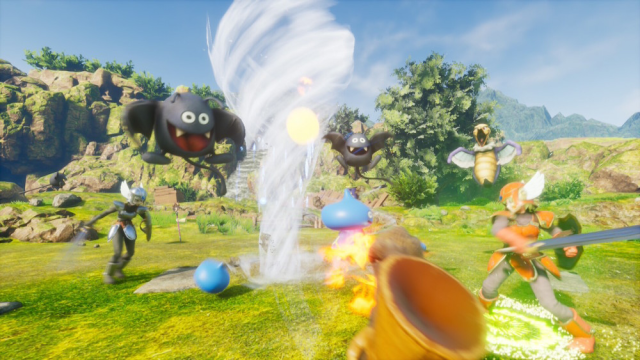 Of course, because this was a short VR adventure, rather than an in-depth JRPG, Dragon Quest VR lacked the experience points, equipment options, and other things that we all know from the home video games, but again, this was wish fulfillment for Dragon Quest fans who have always wanted to physically embody their favourite heroes. When we were lining up before going into the "ride" we were asked what roles we wanted to be. The other girl immediately asked if she could be the mage. Having played Dragon Quest from the very start of the franchise (and remember, she was Japanese, where this series is all-but a religion), it was the video game thing she had always wanted to do. I had no protest. I've always wanted to emulate the swordwork of my favourite fantasy heroes. Let's just say that in practice I've got a ways to go before I'll be Aragon reborn. The ticket to the Dragon Quest VR ride was an additional purchase beyond the entry to the theme park, and not a cheap one at that - it was about $Aus35. But it was so totally worth it. And then we had the excuse to spend the rest of the day playing all the other "rides" too. Let's just say my wife got be back for my less than proficient shield work contributing to the Dark Lord killing the party with a swift green shell to the backside in Mario Kart VR.